1st Bedfordshire and Hertfordshire Regiment (1BEDS&HERTS) advanced to contact with the enemy and each stand of 3 bases opened fire scoring 2 pins (2L=5+6>M=2). In the first move, 1BEDS&HERTS have inflicted three pins on 5BERGn and received only one in return, so in the next move they can close assault the strongpoint. There were no unwounded stands left in the northern strongpoint, so if 1BEDS&HERTS close assaulted, they would just walk over the position, capturing anyone who was in there. 5BERGn were veteran troops however, and passed a morale test for 50% or over casualties scoring a 6! so the Battalion Commander decided that a fighting withdrawal was in order. 1BEDS&HERTS occupied the position. Their supporting Valentine tanks from 4th Royal Tank Regiment (4RTR) declined to pursue the fleeing enemy until the infantry had reorganised, on the grounds that the enemy had probably covered his lines of retreat with anti-tank fire. 14ARTY laid a barrage of 1 medium CU scoring 2 against the medium strongpoint to the south, to no effect. The attack remained stalled. The supporting Matilda battalion of the 1st Royal Tank Regiment (1RTR) began a duel with the DAK 5cm anti tank detachment to their north (DAK PaK). 1RTR (1L=3>M*=0). DAK PaK (1M=6>H=1). 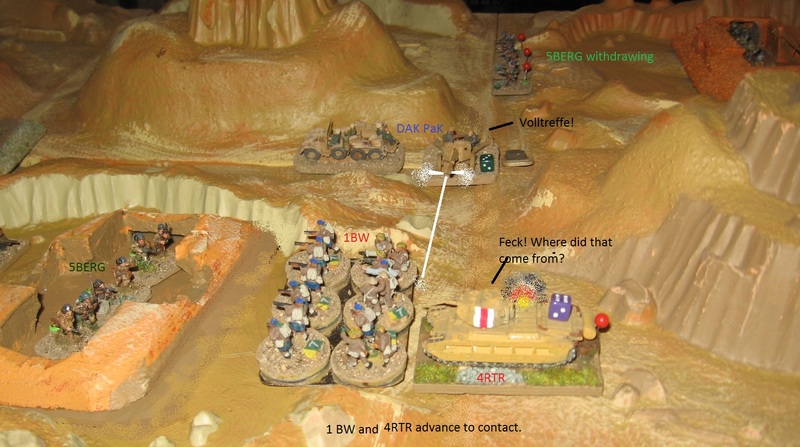 The tank/anti tank duel continued in the south with more sound and fury than actual damage: 1RTR (1L=3>M*=0). DAK PaK (1M=3>H=0), the PaK was now out of ammunition and could only withdraw next move, or sit tight awaiting a close assault. 14ARTY laid a barrage onto the southernmost enemy strongpoint (1M=4>M=1). 5BERGs had now received 50% casualties and failed a morale test on 2. 132ARTY fired on 1BW (1L=4>L=1). 1BW had received 50% casualties and failed a morale test on a 2, becoming disorganised. 14ARTY continued to bombard the southernmost enemy strongpoint to no effect (1M=3>M=0). 132ARTY switched fire onto 1BEDS&HERTS (1L4>L=1). 14ARTY continued the barrage on the southernmost enemy strongpoint 5BERGs. The fall of shot was doing more damage now (1M=4>M=1). 132ARTY continued their barrage on 1BEDS&HERTS (1L=5>L=1). 1BW mounted a disorganised close assault with only one effective fighting base (F1) against the zero strength 5BERGs, which was automatically overrun. RHQ was unable to offer supporting fire to 5BERGs, as they were disorganised. The Valentines of 4RTR supporting 1BEDS&HERTS brought 132ARTY under direct fire (1L=6>M=1) causing 1 pin. 4RTR‘s Valentines closed with 132ARTY causing another pin (1L=6>M=1) and receiving no casualties in return (1L=4>M=0) – I really was not making these die rolls up! It is worth noting that throughout, I have tried to describe as much of the ‘battle’ as possible using language that would be familiar to the commanders of the day. I find battles personally more satisfying doing this than if the language of wargaming is used, as I use games to try and understand the history of the period, as well as being an enjoyable pastime. This worked example supercedes the earlier Battle of WASHBOARD RIDGE. The notation used here is a sort of Chess-style notation that allows me to record the salient points of solo games for future reference, and to keep track in campaigns. For this game I decided that the first people to come under fire would take a morale check, and everyone would at 50%. * I count most Atk guns as Medium in defence when tanks are firing against them, to reflect the anti-tank guns’ low profile and camouflage, as here. ** disorganised units cannot take advantage of supporting fire, and are automatically overrun if close assaulted. *** Tanks do not close assault. They drive into an enemy infantry position as they please, but if the infantry do not surrender or run away, then the tanks are treated as light targets in the next move when close assaulted by the defending infantry if they are unwise enough to stay on the position. See Männer Gegen Panzer to get a feel for what is going on tactically. Since explaining combat in the Battle of WASHBOARD RIDGE, infantry stands have been reduced in strength by 3, reverting to the original version of NQM. See how this works with a combined infantry and tank brigade assault against a defending battalion with anti-tank support. 2018: For the NQM Corps Scale Orbat, a battalion is s3 as opposed to the s6 example below. Forces built up piecemeal in the desert on both sides, so I have taken an arbitary snapshot round about the time of the first GAZALA battles (November 1941) as the basis for a mini campaign. As ever, I am open to suggestions and comments from those with a better knowledge of the period. Model of a Nissen hut with a Campari sun umbrella outside.